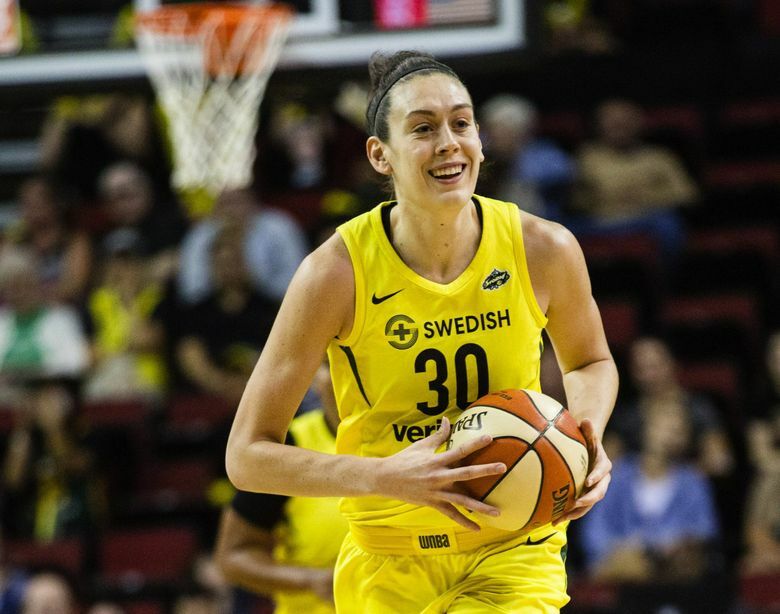 Breanna Stewart — the WNBA’s reigning MVP — suffered a lower leg injury Sunday playing in the EuroLeague Final Four championship game that could potentially jeopardize her upcoming season with the Storm. Stewart appeared to land awkwardly on the foot of fellow WNBA star Brittney Griner, who was defending her, and Stewart immediately grabbed at her lower right leg while grimacing in obvious pain. She was attended to by trainers on the court before being helped to the locker room while not putting any weight on her right leg. The nature and severity of the injury was not immediately known, but unconfirmed reports say Stewart tore her right Achilles tendon. The Storm had no immediate comment, but a team spokesperson said they would give an update once they could determine the severity of the injury. Storm and WNBA players took to Twitter to voice their concern and support for Stewart. In her third season, Stewart led the Storm to the WNBA title after averaging 21.8 points, 8.4 rebounds, 2.5 assists and 1.4 blocked shots. She was also the WNBA Finals MVP, leading Seattle to its third WNBA title and first since 2010. The 24-year-old won four national titles at UConn, and was the No. 1 overall pick in the 2016 WNBA draft. Storm training camp opens May 5 before exhibition games against Phoenix (May 15) and Los Angeles (May 17). The team begins its regular season on May 25 against Phoenix. If reports of an Achilles tendon tear are true, Stewart’s availability to play in 2019 would be seriously jeopardized. Stewart has played overseas during each of the WNBA offseasons since she joined the league. Her Dynamo Kursk squad fell to UMMC Ekaterinburg 91-67 after she left the game. Kentwood and Gonzaga product Courtney Vandersloot, who plays for UMMC, had 18 points, eight rebounds and seven assists. She spent her previous two offseasons playing in China with Shanghai Baoshan Dahua, where she suffered a knee injury in 2017. Nearly two-thirds of WNBA players play overseas during the offseason to supplement their WNBA salaries, which aren’t high. Often, salaries overseas are larger than what players make in the WNBA.